Flavour: Markets, Mercenaries and Money. Development Codename: "Life", of "Life, Liberty, Luxury"
Mercalis is a bustling merchant world dominated by the three main trading cities of Oestra, Halvar and Laresai. Each maintains huge trading fleets and caravans to transport the extremely precious gold mined in the wilderness. Each city covets gold in its own way and for its own reasons. Meanwhile the elves of Irridwood lament the strip mining of their lands and seek aid from their mysterious connection to the Earthsoul. As the land slowly stirs into action, Halvar plots dark schemes, the Gnolls grow more daring and a Herald of whats to come appears in the skies. The primary mechanic that appears in every color except green. White and Black are the primary gold producing colours with Red and Blue being secondary. 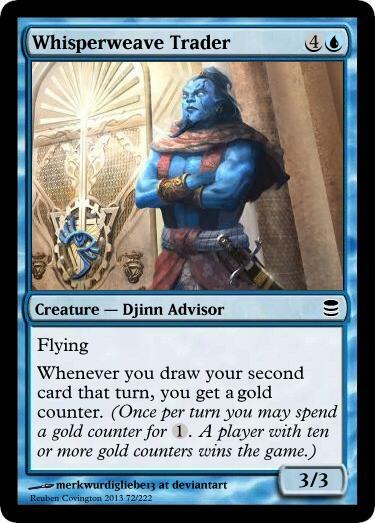 I have been trying to provide a variety of effects that benefit from using gold counters to create a interesting dynamic between spending for extra effect or trying to get 10 to win. Another challenge is to make the gold counters be useful enough that they are not too parasitic. Enchant creature an opponent controls. Whenever you spend a gold counter you may put a +1/+1 counter on Vault Custodian. My main combat mechanic in the set that helps break stalls that players using gold counters often want to create. Appears primarily in Red, Green and White. This also works well with Reshape and other +1/+1 counter manipulation cards. Trained for battle as much as speed, Laresai generals know a message can win a battle as surely as any army. Darting Gladiator can’t be blocked except by two or more creatures. Lord of the forest and master of beasts. Every movement brimming with savage grace backed up the strength of titans. This is the core mechanic that reinforces the "counters matter" theme of the set/block and works extremely well with all three other mechanics. This is often not incredibly powerful but is extremely flexible as it allows you to increase time/ +1/+1 counters on your permanents as well as increase your gold counters. However it can also be used offensivly by removing +1/+1 counters mid combat, removing time counters to kill vanishing creatures and finally remove gold counter to prevent opponent's ramp/win condition. This mechanic is primary in Green and secondary in Blue and Black. In Green this represents the nature magic of growth and decay while in blue and black it is more about the manipulation of magic itself rather than nature. 1G,T: Reshape (Choose a counter on a permanent or player. Remove that counter from it or put another of those counters on it.). A thief that fails his assignment in life may find his second chance a grim affair. My returning mechanic is coming back to provide some faster aggro strategies compared to the midrangy Glorious cards. Vanishing is very interesting this time as it works really well with Reshape, allowing you to have cards usually balanced to only last a small amount of time last longer. Red also has a "brink" mechanic on most of it's Vanishing creatures were they get bonuses when on the final counter. Reshape can also be used against you, providing additional weaknesses that balance the increassed power of some vanishing cards. Vanishing is Primary in Blue, Red and Secondary in Green. Vanishing is flavored as the Elemental creatures unable to manifest for long as well as highly unstable magic they slowly decays. :1mana::symu:, :symtap:: Tap target creature, it doesn’t untap during its controllers next untap step. :symtap:: Flarespitter deals 1 damage to target player. If Flarespitter has exactly one time counter on it, deal 2 damage to target creature or player instead. Sacrifice Delayed Explosive: Destroy all creatures with converted mana cost equal to the number of time counters on Delayed Explosive. Spending a gold counter is simply another way of saying "remove a gold counter" except that it allows me to trigger abilites of it without Reshape causing those same abilites to trigger. This means you can either save your gold counters or spend, making it very flexible and providing the basis for a variety of archetypes. Green gets normal mana ramping and mana production but doesn't get gold counters as the concept of money is alien to green. This is mainly a flavour thing as money is an unnatural concept created by societies and is linked to the major cities that are generally all too happy to strip the wilderness of resources. Green is able to add/remove gold counters using Reshape but you need to splash another colour if you want the gold counters. Remember that you can only spend one gold counter a turn making it far weaker than most ramp that green has access too. Reshape simply addes or removes a counter from a single permanent. You can't add a counter unless it already has a counter of that type. This is very similar to how the card Clockspinning works. Look at the rulings of clockspinning if your interested. Reshape also allows you to make your dangerous vanishing creatures last longer which can be very powerful. This also means if you are keeping a creature at one time counter to activate its bonus ability (if itmis a red card) then you run the risk of an opponent's reshape. This means it cannot be responded to with a reshape therefore denying an opponent mana. This is because mana denial like this can create very unfun situations especially for new players. A cycle of trademasters for each colour that each have an ability that gets a free activations upon spending a gold counter. 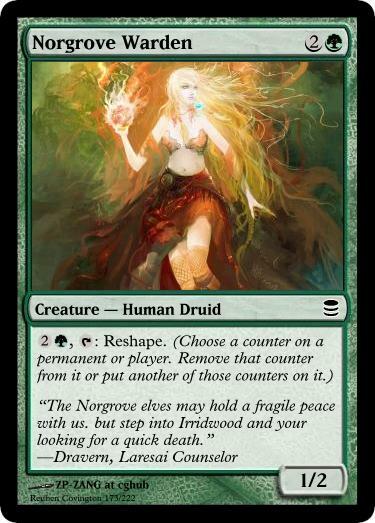 Green instead gets a reshape enhancer as it doesn't use gold counters for both mechanical and flavour reasons. Not 100% happy with the green card yet. Whenever you spend a gold counter, put a 2/2 white Knight creature token onto the battlefield. :3mana::symw:: Put a 2/2 white Knight creature token onto the battlefield. Whenever you spend a gold counter, draw a card. Whenever you spend a gold counter, target player discards a card. :3mana::symb:: Target player discards a card. Activate this ability only any time you could play a sorcery. Whenever you spend a gold counter, gain control of target creature until end of turn. Untap it. It gains haste. :3mana::symr:: Gain control of target creature until end of turn. Untap it. It gains haste. Activate this ability any time you could cast a sorcery. Whenever you reshape you may reshape twice instead. :3mana::symg:: Move a +1/+1 counter from target creature to another target creature. Basic wedge land designs that mirror the tri colour alara lands. Blighted District enters the battlefield tapped. T: Add W, B or G to your mana pool. Forge District enters the battlefield tapped. T: Add W, B or R to your mana pool. Elementals provide a searing blaze that smelt the best Oestran steel. Harbour District enters the battlefield tapped. T: Add U, R or G to your mana pool. Market District enters the battlefield tapped. T: Add W, U or R to your mana pool. Markets in Laresai build skyward like the profits they hope to achieve. Moonlit District enters the battlefield tapped. T: Add U, B or G to your mana pool. Here you can acquire untold wonders or simply an early grave. At the beginning of your end step, If one or more counters were placed on or removed from a permanent you control this turn, you gain 3 life. At the beginning of your end step, If one or more counters were placed on or removed from a permanent you control this turn, you may draw a card. At the beginning of your end step, If one or more counters were placed on or removed from a permanent you control this turn, Battlepit Counselor deals 1 damage to target creature or player. When Caravan Mastadon enters the battlefield, put a 1/1 white Soldier creature token onto the battlefield. Take a single step off the elf paths and your entire caravan is fair game to the forest. Unprofitable hollows are dumped in Halvar bay. Nobody swims there anymore, at least not willingly. Target creature gets +1/+0 and gains haste until end of turn. Oestra doesn’t quite have the negotiating skills of other cities, but don’t let that think you can cheat them and live. Marked not in ink, but in scars upon his hide. Put target permanent on top of its owner’s library, then that player puts the bottom two cards of his or her library on top of his or her library. The Temple of Eternity lies in the center of Laresai. They provide amazing new magics while searching for some mysterious secret. 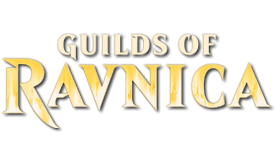 Quas Nova deals 6 damage to target creature or player. If a creature dealt damage this way would die this turn, exile it instead. Are you predator or prey? Nothing else matters. 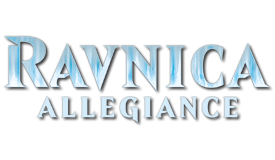 Mono colour guildmage style cycle designed to promote less multicolour decks in limited. :1mana::symw:, :symtap:: Gain 2 life. :3mana::symw:, :symtap:: Prevent all combat damage dealt by target creature this turn. :1mana::symu:, :symtap:: Target creature can’t be blocked this turn. :3mana::symu:, :symtap:: Return target creature you control to its owner’s hand. :1mana::symb:, :symtap:: Each opponent loses 1 life and you gain that much life. :3mana::symb:, :symtap:: Exile target creature card from a graveyard. Put a 2/2 black Zombie creature token onto the battlefield. :1mana::symr:, :symtap:: Target creature attacks this turn if able. :3mana::symr:, :symtap:: Target creature gains double strike until end of turn. :3mana::symg:, :symtap:: Search your library for a basic land card, reveal it, and put it into your hand. Then shuffle your library. 11/10/2013 - Contractual Sabotage, Riptide Plunderer, Windwisp Sentry, Debtslave Hollow, Drowned Mass, Lumin Rot Added. Warehouse Mastiff flavour added. 12/10/2013 - Canyon Spider and Mirestained Bandit added. 13/10/2013 - Reworded Glorious, Tweaked White commons. Claret Collector, Winged Notion & Rite of Return added. 30/11/2013 - Massive Update, (236/242) cards completed, first playtests completed. 01/12/2013 - Lots of minor changes and all art complete for commons. 06/12/2013 - All cards added, more images added, starting development. 27/01/2014 - Added Midasa, the Golden Gaze, reworked Wolfpack Alpha and Crystal Amulet. 28/01/2014 - Removed the "Mage" cycle and replaced them with the "Counselor" cycle. 22/02/2014 - Did a big creative update and lots of minor changes after lots of playtesting. 24/02/2014 - Showed off the Contract and District cycles. 07/03/2014 - Added Trade Nexus and Reliquary of Exuberance to replace two cards that were not working well. 02/05/2014 - More minor development tweaks. Set declared Complete. I'm really confused about reshape. Are we dealing with multiple types of counters on permanents often in this set? Does this mechanic allow a lot of ambiguity vs what sort of counter you replace the old one with? I think you need really really specific wording for that sort of thing to fly. Sounds like people will be messing with counters constantly in your limited season and there will be a lot of judges called to tables because of discomfort or shady plays. Multiple types of counters and regularly turning one into the other is a lot to hold in your head and a lot to have to accurately represent. Cube talk, design community and much much more! The arena of Oestra is many things. Entertainment, battlefield and the training pit for some of the best sell-swords in Mercalis. When Blessing of the Bird enters the battlefield, put a 1/1 white Bird creature token with flying onto the battlefield. When Caravan Mastodon enters the battlefield, put a 1/1 white Soldier creature token onto the battlefield. Cloudborn Harbinger enters the battlefield with five +1/+1 counters on it. At the beginning of each end step, if another creature attacked this turn, remove a +1/+1 counter from Cloudborn Harbinger. Otherwise, you put a +1/+1 counter on it. A change is coming, she is only the beginning. Shaped not with deception, but a clarity of both body and mind. A contract in Mercalis is law. To break one is to break your right to exist. In Mercalis no road goes unguarded. Prevent all damage that would be dealt to you by creatures this turn. If damage is prevented this way, you gain that much life. Prevent all damage that would be dealt to target creature this turn. Untap that creature. The best sell-swords in Mercalis fight not for the promise of gold but for the chance to promote awe in their skills. As long as you control another Advisor, Grizzled Counselor gets +2/+2 and has vigilance. 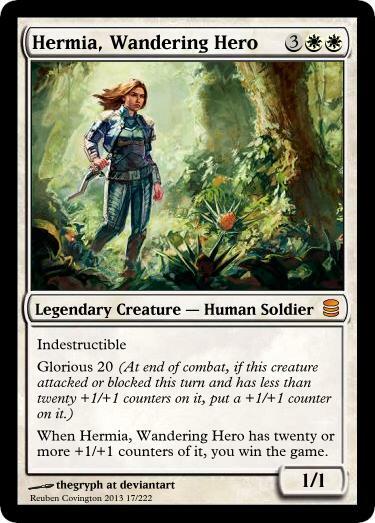 When Hermia, Wandering Hero has twenty or more +1/+1 counters on it, you win the game. “The roads are not safe. The towns are at risk. Put X 1/1 white Soldier creature tokens onto the battlefield. You gain 1 life for each creature you control. Laresai may be considered fat with merchants and trade deals, but break a contract and you’ll soon hear a thundering of armored hoofs. Creatures you control get +0/+11 and gain vigilance until end of turn. When Matron of the Roads enters the battlefield, another target creature gains protection from the color of your choice until end of turn. Traveling the long trade roads, they are seen as guardian of fortune. Always appearing just as as their magic is needed most. The battle was shaped to victory not with his sword but his political influence. Gain 6 life. If mana from a gold counter was spent to cast Prejudicial Mending, put a +1/+1 counter on each of up to two target creatures. Halvar healers are open to all but tossing them a few extra coins can certainly be worth it. At the beginning of each end step, If a creature with glorious you control attacked or blocked this turn but didn’t have a +1/+1 counter put on it this turn, you get a gold counter. Don’t look into the light. : Put a 2/2 white Knight creature token onto the battlefield. Laresai traderooms follow complex rules to guarantee no undeclared magics threaten a contract. Whenever you put one or more +1/+1 counters on Triumphant Leader, you may put that many +1/+1 counters on each other creature you control not named Triumphant Leader. Unsleeping One can attack or block while tapped. Steady and unstoppable like the laws it seeks to uphold. In peace we may find both great strength and great inaction. When Wardwatch Griffin enters the battlefield, you may destroy target enchantment. Oestra, Laresai and Halvar will all try to gain a griffin’s favor. Their ability to detect and demolish unwanted magics is too valuable to ignore. At the beginning of your end step, If one or more counters were placed on or removed from a permanent you control this turn, draw a card. Draw three cards, then put a permanent you control on the bottom of its owner’s library. “From legends we discovered the Æther. From the Aether we seek knowledge. From knowledge we seek a spark of legends greater still. Whenever you cast an instant or sorcery spell, you may draw a card. Weft no in this world, but the liquid of the Æther. Counter target creature, artifact or planeswalker spell unless its controller pays 2 plus an additional 2 for each gold counter you have. At the beginning of the upkeep of enchanted creature’s controller, that player puts the top two cards from his or her library into his or her graveyard. Each creature target opponent controls becomes a copy of target nonlegendary creature until end of turn. 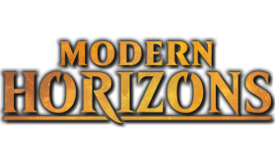 Each opponent shuffles their hand, graveyard, and all permanents they own into their library, then draws seven cards and their life total becomes their starting life total. Skip your next six turns. Exile Forward into History. Great tides bring great change. Insomnia Behemoth’s power and toughness are each equal to the number of nonland cards in your opponents’ graveyards. Tap an untapped creature you control: Target player puts the top card of his or her library into his or her graveyard. , : Tap target creature. That creature doesn’t untap during its controllers next untap step. When Lighthouse Keeper enters the battlefield, look at the top card of your library. If it’s an instant or sorcery card, you may reveal it and put it into your hand. When Liquideous Sprite enters the battlefield, return target creature you control to its owner’s hand. You may reveal each card you draw. Whenever you reveal a nonland card this way, Manaflare Phantom gets +X/-X until end of turn, where X is that card’s converted mana cost. 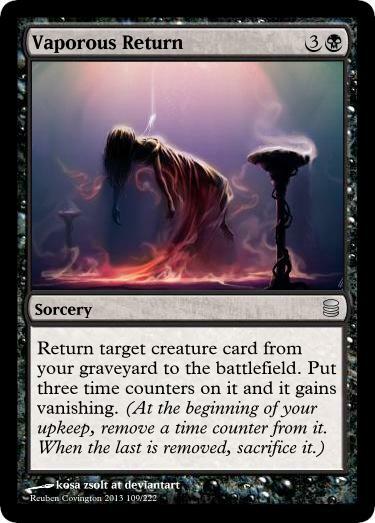 Whenever an instant or sorcery card is put into an opponent’s graveyard from anywhere, you may exile it. 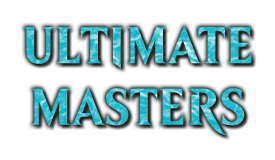 , , Sacrifice Master Spellsnatcher: Copy a card exiled with Master Spellsnatcher. You may cast the copy without paying its mana cost. Return target creature to its owner’s hand. If you have five or more gold counters, you may put that creature on top of its owner’s library instead. A single drop will kill the pain, an ‘accidental’ overdose will see you sleeping for a week. Whenever another creature an opponent controls becomes tapped, you may untap Pearly Ectozoa. You may tap or untap target creature. You may search your library for up to three cards named Repeat, reveal them, put them into your hand, then shuffle your library. When Riptide Plunderer enters the battlefield, draw two cards, then discard two cards. : Look at the bottom card of your library. You may put that card on top of your library. Sleeper of Alt’Valis can block seven additional creatures. When Sleeper of Alt’Valis enters the battlefield, up to eight target creatures get -8/-0 until end of turn. Reveal the top seven cards of your library. Put all instant and/or sorcery cards revealed this way into your hand and the rest into your graveyard. When Tidal Ambassador enters the battlefield, if you cast it from your hand, you may exile another target creature you control, then return that card to the battlefield under your control. Whenever Tidal Ignus attacks, you may have target creature get -2/-0 until end of turn. At the beginning of your upkeep, choose one — Draw a card; or put two time counters on Timeweft Runes. , Remove a time counter from Vapourform Ignus: Target creature can’t be blocked this turn. When Vortex Crystals enters or leaves the battlefield you may return another target creature to it’s owners hand. An elemental’s existence is short but cheap. Perfect servants of the city counselors. Whenever Winged Notion attacks or blocks, tap Winged Notion and it doesn’t untap during your next untap step. Counselors can’t risk fleeting emotions effecting trading deals. instead, siphoning them off to form useful servants. Nothing is safe when money gets involved. Cash Street Sentry gets +3/+3 as long as you have five or more gold counters. Spend enough gold in Halvar and you can get anything or anyone you want. When Claret Collector enters the battlefield, each opponent loses 1 life. Whenever you get a gold counter, you may have target creature get -1/-1 until end of turn. Death is always a good investment. Signed not on paper, but the screams that pierce the air. When Cranial Gnawer dies, target player puts the top five cards of his or her library into his or her graveyard. When Crossroad Shade enters the battlefield, target creature gains intimidate and haste until end of turn. : Crossroad Shade gets +1/+1 until end of turn. Draw two cards. If mana from a gold counter was spent to cast Dark Knowledge, you gain 3 life. Otherwise, you lose 3 life. When it comes to morbid secrets. The counselors of Halvar know even the dead crave the touch of gold. Whenever Debt Baron attacks, target player loses 1 life for each gold counter you have. You gain life equal to the life lost this way. The vampires of Halvar are vicious loan sharks, accepting interest only in blood. Hollow are perfect workers, untiring and eternal. That their souls suffer is of no concern to Halvar’s profits. Name a creature card. Search target player’s hand, library and graveyard for any number of cards with that name and exiles them. Exile all permanents that player controls with that name. Then that player shuffles his or her library. Whenever enchanted land becomes tapped, its controller loses 2 life and you put a 2/2 black Zombie creature token onto the battlefield. Target player sacrifices the creature with the greatest power he or she controls. Target creature gains lifelink until end of turn. Regenerate it. “Greed and power breeds here yet the parliament works together for the benefit of everyone. A thief that fails his assignment in life may find any second chance a grim affair. Whenever a creature dies, its controller loses 1 life. It hunts screams. Leaving twisted magic in its wake. , : Exile target non-Gorgon creature then its controller gets a gold counter. As an additional cost to cast Nightdread Demon, untap two tapped creatures you don’t control. His victims wake to find the nightmare has only just begun. Halvar’s parliament rules the city, carefully eliminating any that threaten their society. Each citizen provided for so long as they remain dedicated to increasing the city’s sinister influence. Whenever Pitborn Harbinger attacks, you may discard your hand. If you do, draw six cards and lose 6 life. As an additional cost to cast Rite of Undeath, sacrifice a creature. Return three creature cards at random from your graveyard to your hand. For those with money and the right magic, death is only an inconvenience. If you would sacrifice another creature, you may pay and sacrifice Sacrificial Acolyte instead. At the beginning of the upkeep of enchanted creature’s controller, that player loses 1 life and you gain 1 life. Remove all counters from all permanents. Whenever you spend a gold counter, if its your turn, target player discards a card. Target opponent sacrifices each creature he or she controls. Return a creature from your graveyard to the battlefield for each creature sacrificed this way. Battlelust Ignus enters the battlefield with X time counters on it. Battlelust Ignus gets +1/+1 for each time counter on it. Bloodsport Ogre attacks each turn if able. A dance of swords and skill may appeal to the rich. However the Arena of Oestra knows some crowds have more brutal tastes. You may choose new targets for target instant or sorcery spell. Burning Redirection deals damage to target player equal to that spell’s converted mana cost. Cinder Flayer gets +4/+0 as long as it has exactly one time counter on it. Enchanted creature gets +1/+0 for each time counter on Consuming Passion. Forged not with greed, but in the passion for battle. 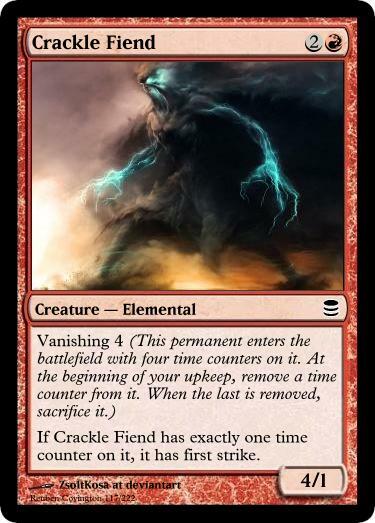 As long as Crackle Fiend has exactly one time counter on it, it has first strike. As an additional cost to cast Crackling Imagination, exile a nonland card from your hand. Crackling Imagination deals 1 damage to target creature or player. You may play the exiled card this turn. Whenever Fireblood Tyrant attacks, gain control of up to two target creatures controlled by defending player, These creatures are tapped and attacking. Return these creatures to their owner’s control at end of combat. Men pray for power, men who’ve seen dragons pray to never see power again. Oestran sell-swords may seem an unruly lot but on the battlefield they fight with passionate perfection. : Flarespitter deals 1 damage to target player. If Flarespitter has exactly one time counter on it, it deals 2 damage to target creature or player instead. Choose one — Flashfire deals 3 damage to target player; or Flashfire deals 2 damage to target creature and that creature can’t block this turn. : Forge Sparker gets +1/+0 until end of turn. As long as Forge Sparker has exactly one time counter on it, it has trample. Forked Inferno deals 2 damage to target creature or player and 2 damage to another target creature or player. At the beginning of your upkeep, if an opponent has more gold counters than you, tap GlintEye Cyclops. Gnoll creatures you control get +2/+0 as long as you control three or more Gnolls. Gnoll Raiders attacks each turn if able. As long as you control three or more gnolls, Gnoll Raiders has haste. They pillage not for wealth or supplies but because they simply enjoy it. Gnoll creatures you control have intimidate as long as you control three or more Gnolls. The tunnels under Grancliff Pass are swarming with gnolls. The trade route is lucrative but any caravan needs a heavy guard. Gnolls are cowardly scavengers only daring to attack the weak or injured. Dangerous in packs. If they sense your weakness you should pray they kill you quickly, as they’re known to take pleasure in ‘playing’ with their food. When Grancliff Ogre enters the battlefield, put three 1/1 red Gnoll creature tokens onto the battlefield. Tap a Gnoll you control: Grancliff Ogre gets +1/+0 and gains trample until end of turn. Its hard to get an ogre even more angry than usual but the gnolls manage it somehow. When Grancliff Rahkjaw enters the battlefield, you may destroy target artifact. Their pelts are worth a fortune but so is the price in blood required to acquire one. As an additional cost to cast Loot in Flames, discard a card. Choose target player. Reveal the top two cards of your library and put them into your hand. Loot in Flames deals 1 damage to that player for each red card revealed this way. Gain control of target creature until end of turn. Untap that creature. It gains haste until end of turn and must be blocked this turn if able. Whenever Meteor Pheonix attacks, if it has exactly one time counter on it, it deals 13 damage to target creature an opponent controls. Discard a Mountain or red card: Return Meteor Pheonix from your graveyard to your hand. Put a +1/+1 counter on target creature. It gains double strike until end of turn. Oestra’s sell-swords are in constant demand. Be it to protect a caravan or for a more destructive purpose. X target creatures attack this turn if able. Normal fire burns the flesh. Quasfire burns something deep inside us. Stripping us of everything but our hate. Destroy target land. Then if its controller controls six or more lands, you may destroy another target land that player controls. Elemental servants that escape often turn their rage back on the cities that enslaved them. When Sell-Sword Elite enters the battlefield, if mana from a gold counter was spent to cast it, it gains haste. Whenever Sell-Sword Elite attacks, target creature can’t block this turn. The world is his to forge. Creatures you control have trample and haste. Whenever you spend a gold counter, gain control of target creature until end of turn. Untap that creature. It gains haste until end of turn. : Gain control of target creature until end of turn. Untap that creature. It gains haste until end of turn. Activate this ability any time you could cast a sorcery. Put a +1/+1 counter on target creature. It must be blocked this turn if able. Reveal X cards from the top of your library. Put all basic land cards revealed this way onto the battlefield tapped and the rest into your graveyard. For the elves each new vista is a potential wonder. For the cities its a potential profit. For each creature and land you control, you may search your library for a card with the same name and put it onto the battlefield. Shuffle your library. Choose land or nonland. Reveal cards from the top of your library until you reveal a card of the chosen kind. Put that card into your hand and all other cards revealed this way on the bottom of your library in any order. Repeat this process for each creature you control. “Is it the elves that attack our precious gold mines or the elementals? Have mercy on us if its both. When Canopy Ranger enters the battlefield, you may have it deal 3 damage to target creature with flying. Crumbling Forestral enters the battlefield with a time counter on it for each Forest you control. Crumbling Forestral’s power and toughness are each equal to the number of Forests you control. Earthcall Hydra enters the battlefield with X +1/+1 counters on it. When Earthcall Hydra enters the battlefield, up to X lands you control become 3/3 green Elemental creatures until Earthcall Hydra leaves the battlefield. They’re still lands. 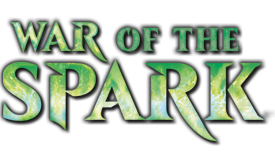 When Earthsoul Bear enters the battlefield, distribute two +1/+1 counters among one or two target creatures. Prevent all combat damage that would be dealt this turn. Creatures with flying your opponents control don’t untap during their controller’s next untap steps. Giant Landshark enters the battlefield with a +1/+1 counter on it. Giant Landshark has trample as long as its power is 7 or greater. Remove a +1/+1 counter from Greyhide Stomper: Regenerate Greyhide Stomper. Whenever Grizzled Fangthane attacks, if it has one or more +1/+1 counter on it, you may have it fight another target creature. Whenever an Elemental creature enters the battlefield under your control, you may search your library for a basic land card and put it into your hand. If you do, shuffle your library. , Sacrifice a basic land: Put a 3/3 green Elemental creature token onto the battlefield. : Untap up to one target Forest. You gain 1 life. Lord of the leaf-marked and master of beasts. Each movement brims with grace and power. Leaf-Marked Elder can’t be countered. Each player can’t draw more than one card each turn. He runs across the canopy, with a grace unimaginable to those who live so briefly. : Norgrove Sentry gets +2/+2 until end of turn. Activate this ability only once each turn. Enchanted land is a 3/3 green Elemental creature. It’s still a land. When enchanted land leaves the battlefield, you may return Primal Stirrings from your graveyard to the battlefield. Whenever Scavenging Boar or another creature enters the battlefield under your control, you may exile a target creature card from a graveyard. If you do, you gain 3 life. Remove a +1/+1 counter from Supreme Fangthane: Supreme Fangthane gains your choice of trample, deathtouch, hexproof or reach until end of turn. If you would reshape, reshape twice instead. Search your library for a basic land card and put it onto the battlefield tapped. If it’s a Forest, put a +1/+1 counter on up to one target creature. Then shuffle your library. Voraginous Wurm can’t be blocked by more than one creature. “Its only dream is food. Wolfpack Alpha has intimidate as long as you control three or more Wolves. Whenever you cast a creature spell put a 2/2 green Wolf creature token onto the battlefield. Wolfpack Outrunner enters the battlefield with a +1/+1 counter on it if another creature entered the battlefield under your control this turn. The howl before the horde. Noncreature spells you cast cost 1 less to cast. Creature spells your opponents cast cost 1 more to cast. Whenever a creature deals combat damage to you, you may return it to its owner’s hand. At the beginning of each player’s end step, if a card was put into that player’s graveyard from anywhere this turn, put a +1/+1 counter on Insanity Mantis. A scavenger of both death and madness. Whenever you sacrifice a permanent, you may have Grimflame Rite deal 1 damage to target creature or player. Creatures you control gain indestructible until end of turn. Put a +1/+1 counter on each of those creatures. The autumn harvests bring great riches to Mercalis and form the core of the fragile peace between the elves and the cities. +1: Name a nonland card. Until your next turn, the named card can’t be played and prevent all damage from sources with that name. -X: Destroy all creatures with converted mana cost X or less. As an additional cost to cast Writ of Supremacy, sacrifice a creature. Choose target creature or player. Return target instant or sorcery card from your graveyard to you hand. Searing Memory deals damage equal to that card’s converted mana cost to that creature or player. Exile Searing Memory. Whenever another creature dies, put a +1/+1 counter on target creature you control. Art and war are inseparable to him, his every blow focused as much to the crowd as to his opponent. +1: Creatures you control get +1/+0 and gain vigilance until end of turn. -7: Katie, Ascended Sword deal 5 damage to each opponent and each creature you don’t control. You gain life equal to the damage dealt this way. Double Strike, protection from enchanted creatures. Whenever Yandor, Oestran Champion deals combat damage to a player, you may exile target enchantment or enchanted creature. Protection from creatures with +1/+1 counters. , : Put a +1/+1 counter on target creature. They once were Laresai counselors. Now they study the dreamscape, hoping to someday tap the full potential of mortal dreams. Dreamscape Hydra’s power and toughness are each equal to the total number of cards in all player’s hands. If a source would deal damage to Dreamscape Hydra, prevent that damage. Each player draws cards equal to the damage prevented this way. +2: Until your next turn, you may cast creature cards as though they had flash. -3: Draw a card for each creature you control. -10: Gain control of all creatures. Put three +1/+1 counters on each creature you control. At the beginning of your upkeep, if you are not the owner of Captivating Bauble, that player gets a gold counter. : Put the top seven cards of your library into your graveyard. Target player gains control of Captivating Bauble. Weak minds deserve to be cheated. You may spend mana from gold counters as though it were mana of any color. A refraction of Mercalis in colors impossible to behold. Sacrifice Delayed Explosive: Destroy each creature with converted mana cost equal to the number of time counters on Delayed Explosive. Ebony Gargoyle enters the battlefield tapped. Halvar mansions never go unguarded. If equipped creature would be destroyed, regenerate it and put a +1/+1 counter on it. Tap two other untapped creatures you control: Hunter Automaton gets +2/+0 until end of turn. : Add one mana of any color to your mana pool. Mana-Trade Courier doesn’t untap during your next untap step. Gathering foreign mana. These neutral constructs travel Mercalis providing a rare but vital service for every marketplace. Equipped creature gets +1/+1 and has “ : You may tap or untap another target creature”. Equipped creature has flying and trample. The roads may be used for most trade and travel but when something urgent is needed by one of the cities, they call upon these unstoppable airships. : Each opponent gains 1 life then you gain 2 life. :2mana:, : Each opponent draws a card, then you draw two cards. :4mana:, : Each opponent may return a creature card from his or her graveyard to his or her hand, then you may return up to two creature cards from your graveyard to your hand. :1mana:, : Add one mana of any color to your mana pool. Whenever you spend a gold counter, you may put a +1/+1 counter on Vault Custodian. Pollution in Halvar is not seen as a problem but simply another weapon. Roads are the veins of Mercalis and trade is its blood. The flames of elementals heat the furnaces of industry. The bounties of nature provide both endless beauty and untapped profits. If there is vanishing I really wish there was suspend. Also, its not too easy to get 10 gold counters, right? One interesting thought is how they are poison counters in reverse. Could have a lot of fun with that kind of thinking. Ah thank god, I thought it did both! So it's like a more interesting proliferate? Kinda, proliferate allows for addition to ALL counter while this selects a single counter on a single permanent or player and allows you to either add or remove one. Courier Dove: Nice flavour text. Laresai Attendants: How come it's blue and not white? Keyblade Hollow: Is the idea here that he steals gold? Delayed Explosives and Bounty are my favourites here. Nice work! Not 100% sure on what I want the flavour for black reshape to be yet. Currently it is Stealing/warping magic while green is more the constant flux of nature. Will be remaking Irrigation Pest as I am not happy with it flavour wise. Plainswalk is a difficult one but I need it to complete a cycle. Glad you enjoy Bounty, Courier Dove and Delayed Explosives. I actually have art and renders for all three of those cards which I can post up to make you happy. 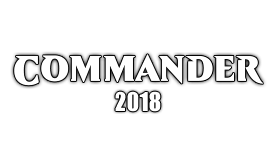 Remember to check out my [CMC] White commons thread as I would love some more feedback. Extra cards added today because I had some extra time. Put X 2/2 white Knight creature tokens onto the battlefield. Up to X target creatures don’t untap during their controller’s next untap step. A contract in Halvar cannot be escaped. The Hollows providing a grim reminder to those that think death will set them free. Up to X target creatures attack this turn if able. Reveal X cards from the top of your library, put all basic land cards revealed this way onto the battlefield tapped, and the rest into your graveyard. Also thinking of changing Dazzling Presence as currently is too narrow. Destroy all Auras attached to target creature. Been working on a bunch of lore for the set. Here is a showcase of a few cards that show some of the flavour I've been exploring. When Riptide Pluderer enters the battlefield, draw two cards, then discard two cards. Hollow are perfect worker, untiring and eternal. That their souls suffer is of no concern to Halvar’s profits. Gold, silver and lumin. The cities go to so much effort to acquire these yet with but a word I can return them them to their earthy womb. A cycle of common landwalk creatures today. Will be making tweaks to White and Blue commons and hopefully releasing the rest of the blue commons tommorow. When Caravan Mastadon enters the battlefield put a 1/1 while Soldier creature token onto the battlefield. Whenever Mirestained Brigand deals combat damage to a player, you may discard a card. If you do, draw a card. Too unruly to be a profitable mercenary he instead accepts insane dares to pay for his revelry. Continuing to flesh out my commons, plan on releasing all my blue commons tomorrow. This means that the +1/+1 counter is applied at end of combat rather than end of turn which is more intuitive and means burn based removal is slightly more pressured to be used before combat. When Claret Collector enters the battlefield, Claret Collector deals 1 damage to each player. As an additional cost to cast Rite of Return, sacrifice a creature. Return up to three cards at random from your graveyard to your hand. Would also love some additional feedback on my white commons. Made a few changes to my blue commons today as well as finished a few mythics. Some are story related (Yandor) while others are just cool cards I think fit. Dreamheart Hydra’s power and toughness are equal to the total number of cards in all player’s hands. If a source would deal damage to Dreamheart Hydra, prevent that damage. Each player draws cards equal to the damage prevented this way. Would love some more comments about the set. Will have most of the commons out by the end of next week. Also someone on the Blue commons thread suggested renames Reshape to Recount. Wondering if it made it more intuitive? Just a few common artifacts today. :1mana:, :symtap:: Add one mana of any color to your mana pool. Just some minor changes to a couple of commons and 2 new cards. Gnoll Sentry can’t be blocked by creatures with flying. Whenever Gnoll Pillager deals combat damage to a player, that player discards a card at random then draws a card. When I think of gold counters I think of the wild west and gunslingers and bank robbers but I love gold counters. It is nice but to confirm you get gold counters but why not also allow creatures to have them and they get a bonus. Complexity issues would be a major reason. I already have 2 types of counters on creatures in this set. (time counters and +1/+1 counters) adding gold counters to creatures would also make for a very different flavour to what I'm going for. Sorry I missed posting a card yesterday, been stupid busy with real life. Todays card. An interesting soft pacifism variant. Surgescape is an amazing card and should totally earns the rarity. In limited this card is pretty much I can play pretty much any bomb in any color with this card and in constructed... its like Sol Ring for Colored though it might be broken 4.4/5 AMAZING. Nearly finished the black commons. Will release them on Friday as I have a massive assignment due on Thursday night so need to concentrate on that. Glad you like Surgescape. Considering Gemstone Mine and how this vanishes so fast I believe it should be balanced. Vaporous Return is uncommon due to it being insane with other vanishing creatures (they ETB with an additional 3 counters) therefore justifying the cost. Not sure how this creature will tie into the set flavour wise but I like the mechanics it has. 1GU,T: Put a +1/+1 counter on target creature. Until end of turn, whenever target creature deals combat damage to an opponent, that player discards a card. As an additional cost to cast Greater Good, sacrifice a creature.